So awesome that you won that! Those shoes will go with everything! What an amazing giveaway to win! Sounds like your birthday this year was full of good treats (Prada and Chanel? Always a good combo!) Can't wait to see how you wear your shoes! Ack, I know! I have definitely been spoiling myself a bit too much... maybe it's time for the dreaded shopping ban! Lucky you! Congratulations again on passing the bar exam. Wow, that is a seriously amazing contest to win!! And those shoes are STUNNING!! 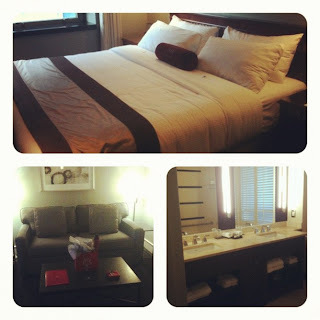 I've always wanted to try a staycation--looks like you had a great time! PS those Prada heels are a stunning pick. Aw that sounds like such a wonderful contest, so jealous! And those shoes...yet another thing to be jealous about! They're stunning! What an exciting trip to win! Amazing shoes! nice shoes! perfect for work! & can still be worn with a pair of skinny jeans for a casual day! Those shoes are GORGEOUS! Sounds like you had a nice mini vacation. Great shoes. Such a lovely post. Lucky gal! I'm super happy for you, all I ever won was a Panasonic sweatshirt! I look forward to having you back in Vancouver and then it's coffee time! Amazing pumps! Thanks for your lovely comment on my blog, following you back :)! Ooo lucky girl!!! Those shoes are so nice!! You're so lucky. Congrats! And i think you've found the perfect pair of black pumps! Those prada pumps are beyond gorgeous. So envious of your contest prize! These classic Prada pumps are the perfect height. These days I've eschewed glittery and glitzy heels for simple plain pumps. I just think they're more versatile and flattering. omgosh that's AMAZE hon!! so awesome to win that contest.. that room is so luxurious! and your new patent pointy prada's are soo classical and chic! i love them they're beautiful!! amazing pumps and what a great time you had! xO! Lucky you! I love those prada pumps - very classy. Hell, I love prada shoes in general! wow that's so nice love the shoes! That is so awesome that you won that! What a fabulous night that must have been! I'm so in love with those Prada pumps!! Those are the PERFECT wardrobe staple.